On our way from the U.S. to Morocco we had an eight hour layover at the Frankfurt airport. Rather than just wait the entire time at the airport, we decided to take a train to Heidelberg, an interesting town about 90 km (56 miles) south of Frankfurt. While there are several ways to get there, including an airport (Lufthansa) shuttle, we opted for the train. Heidelberg is a university town (Heidelberg University, founded in 1386) nestled in a narrow valley along the Neckar River. It has a quaint old section (called Altstadt), with some walls, gates, historical buildings including a castle and market squares. The origins of Heidelberg go back at least to Roman times. A view of Alstadt (Old Town) from the Castle grounds. We are fortunate that Heidelberg escaped serious damage in World War II. It was not bombed by the Allies and the retreating German army destroyed part of the Old Bridge, but that was about all. 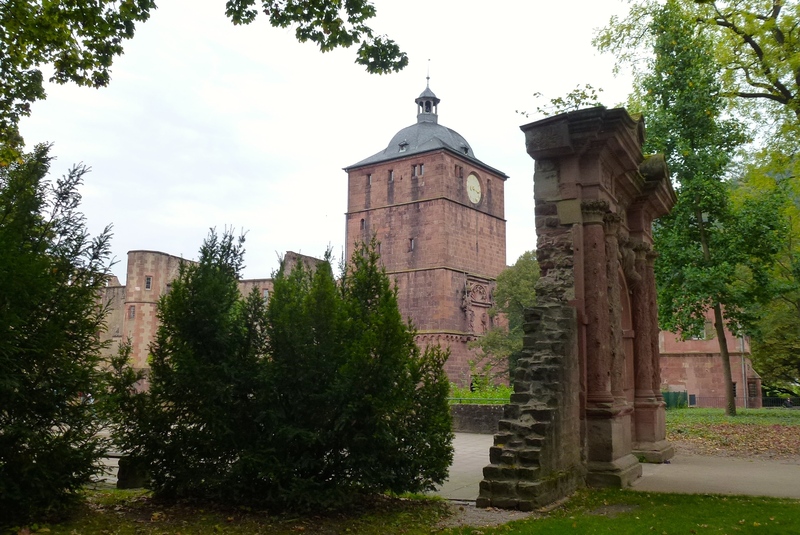 Castle (Heidelberger Schloss). The castle is a bit of a mish mash of several different building eras. The original castle dates back to the mid 1100’s, but was destroyed and rebuilt over the centuries. It sits on the steep hillside over looking the old town and the river. 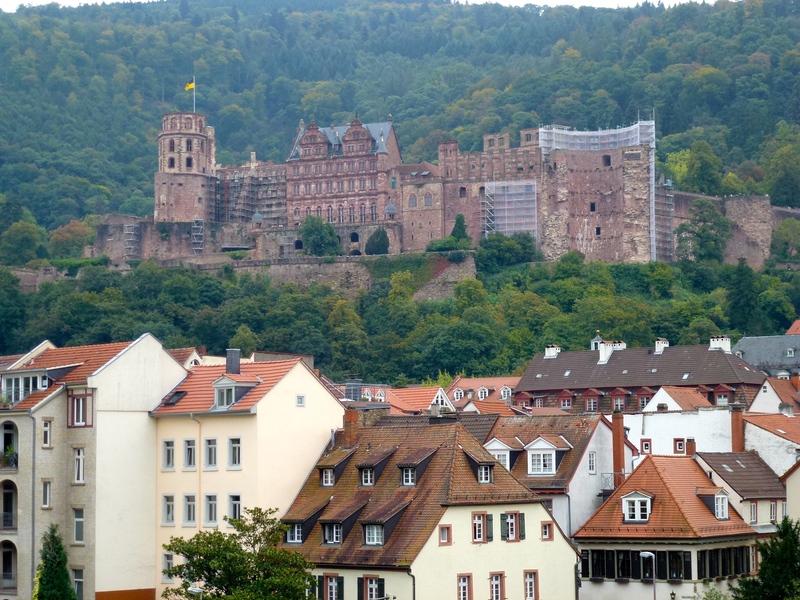 A view of Heidelberg Castle from Altstadt. 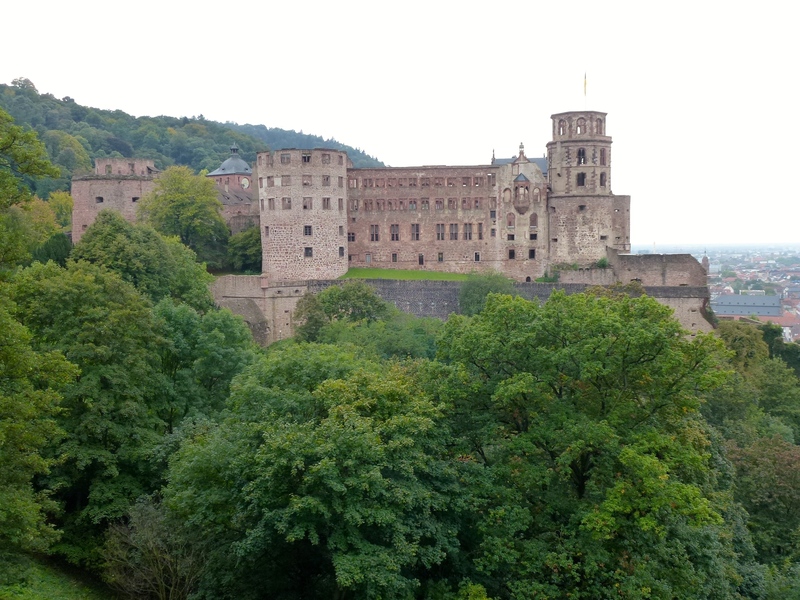 Another view of Heidelberg Castle from the gardens. There are some lovely gardens surrounding the castle that provide good views. Having been in many castles, and given our short stay, we did not go inside. A clock tower on the castle grounds. Old Bridge (Alte Bruecke). This 18th century bridge provides a great view of the town, just walk underneath the Bridge Gate and onto the bridge for excellent photo opportunities. 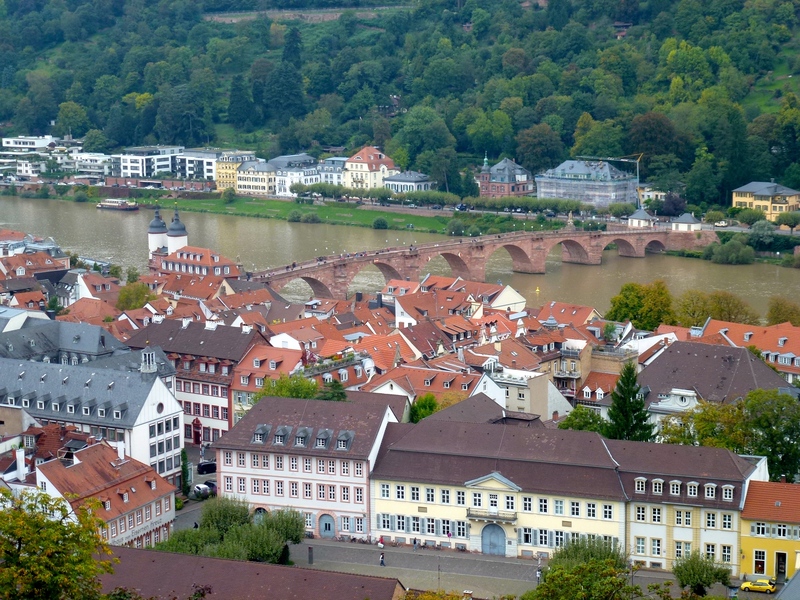 A view of the Neckar River and the Old Bridge from the Castle Gardens. Church of the Holy Spirit. In the Marktplatz (square) the church dominates the setting. Lots of great restaurants around the square. We ate a good traditional meal at a restaurant on the square, just across from this church. 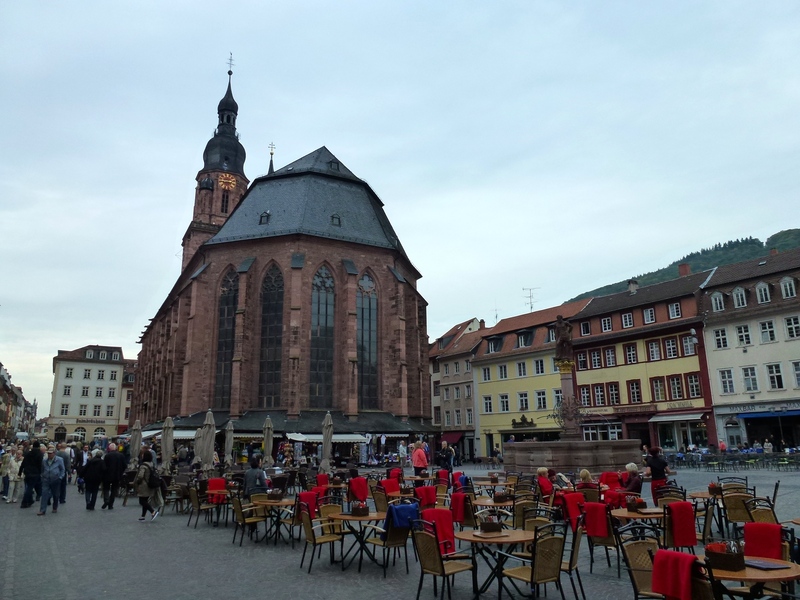 The Church of the Holy Spirit sits in the middle of the Marktplatz surrounded by shops and restaurants. Hauptstraße. 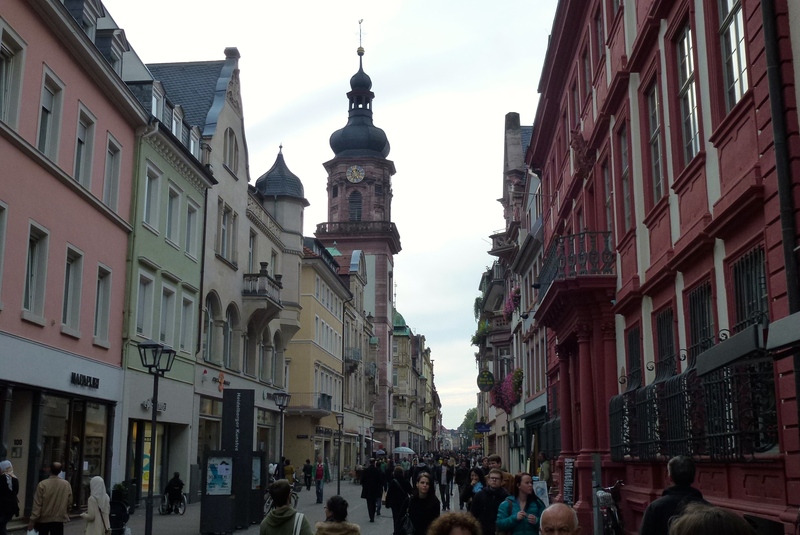 This is the main shopping thoroughfare that connects Altstadt with the modern city. 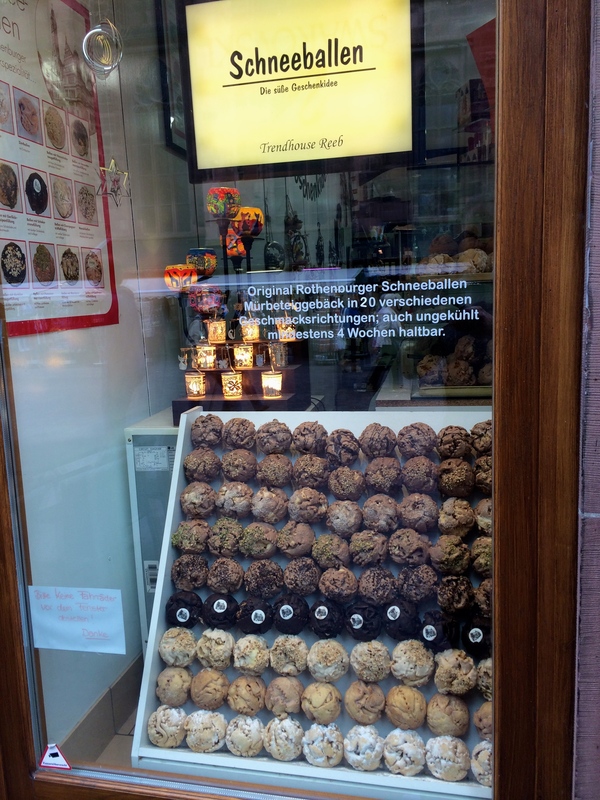 Lots of quaint shops selling trinkets, gelato, and German baked goods. Tasty schneeballen (snowballs), a German pastry. Looking west down the Hauptstraße. There are a number of other old historical buildings to see, including the Rathaus (Town Hall), stables, students prison, other old university buildings (most of the university is now on the other side of the river), and a Witch’s Tower. 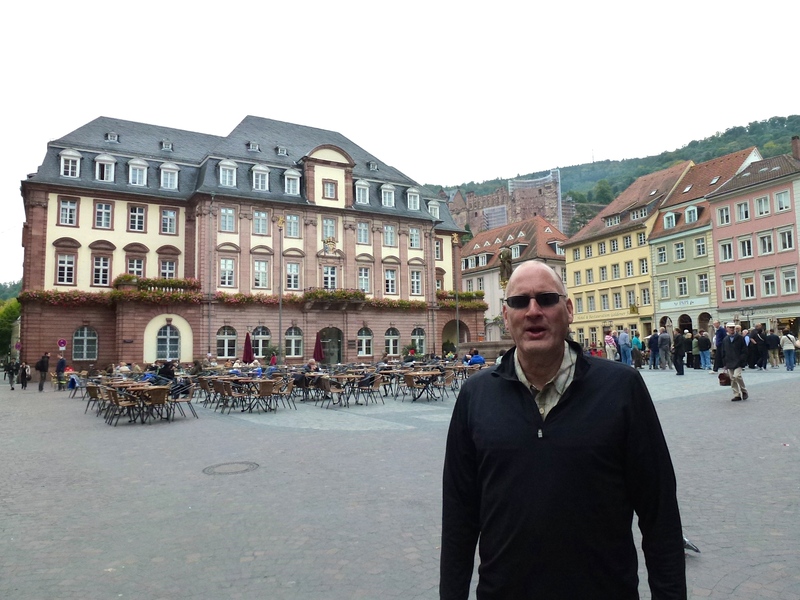 Old Heidelberg’s Rathaus is behind me. 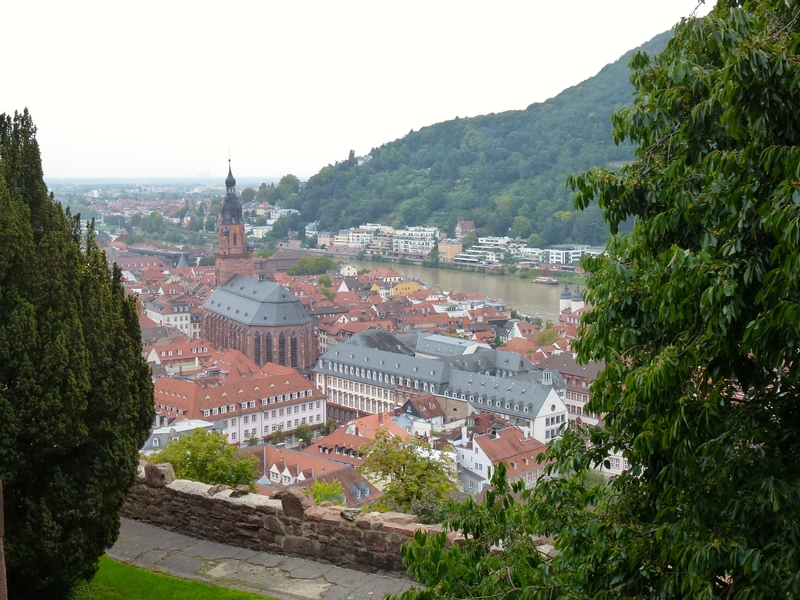 We love quaint European towns and Heidelberg is another great one to visit, even if just for a few hours. Logistics. The train was about 50 euro ($65 at the time) per ticket. You have to transfer trains once (in the nearby city of Mannheim). The whole trip takes about 75 minutes each way, depending on the connection time in Mannheim. Go to the train information and ticket office located below the arrivals terminal at the Frankfurt airport. They can provide you with an itinerary, timing and your tickets. Don’t get off the train in Heidelberg until you arrive at the main (Hauptbahnhof) station. The historic center is a long walk or a short bus ride east of the train station. We took the bus (#3) to the Old Town from the train station and then walked back (which took about 25 minutes). We did the whole round trip from Frankfurt airport, including dinner, in about 5 hours. 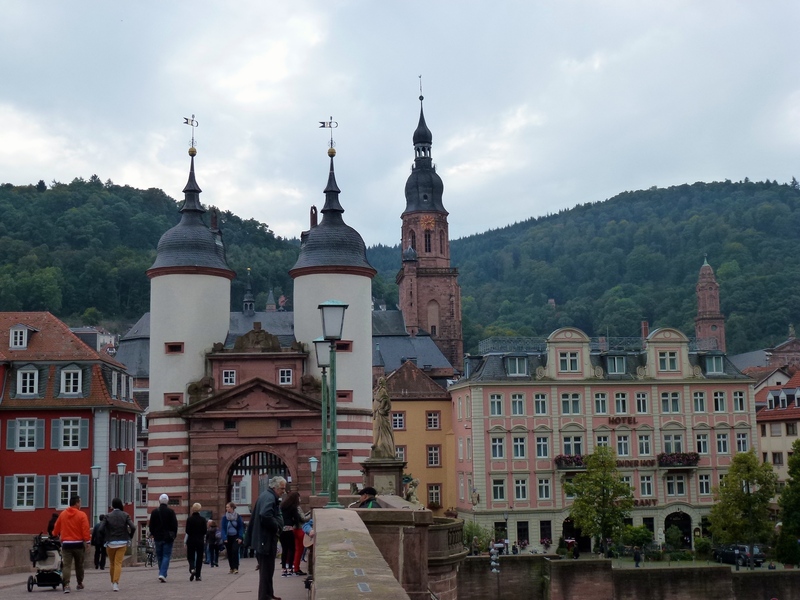 Posted in Germany and tagged Heidelberg Castle, Heidelberg Germany, Things to see near Frankfurt Germany, Visiting Heidelberg from Frankfurt on March 8, 2015 by Paul Terry.